The graduation rate of African-American men’s basketball players from teams participating in the NCAA Tournament is 74 percent compared with 93 percent for white players. That’s according to a study released Tuesday by The Institute for Diversity and Ethics in Sport at the University of Central Florida. The rate in 2016 was 75 percent. It's the first decrease since 2011, according to the study’s author Dr. Richard Lapchick. The graduation rate for white male basketball players remained the same as last year. White female basketball players on tournament teams graduated at a rate of 96 percent compared with 87 percent for black female players. 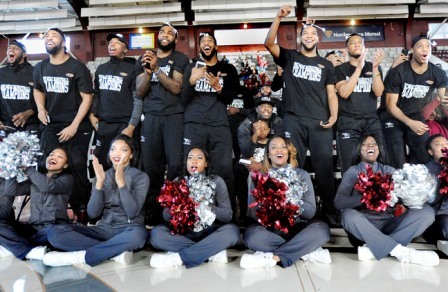 However, NCAA spokesperson Stacey Osburn pointed out the most recent single-year graduation rate in 2015-16 for black men’s basketball players overall was at 77 percent _ an all-time high. She said over the 15-year period the NCAA has been collecting data, the graduation rate for black men in basketball has increased from 46 to 77 percent, which indicates major progress. For white men over the same span, it increased from 76 to 94 percent. Overall, the study indicated women’s teams in the tournament are graduating at a rate of 90 percent, compared with 76 percent for the men. The one-and-done factor on the men’s side doesn’t apply to the study, Lapchick said. Those students are not included in the findings if the athlete leaves in good academic standing. “In most of those situations, schools are pretty careful to make sure that student stays eligible,” he said. Lapchick suggested the NCAA needs to raise its academic progress rate to 60 percent rather than the current 50. He said 78 percent of the men’s teams and 97 percent of the women’s teams currently meet those standards, but more schools need to strive to reach that level.